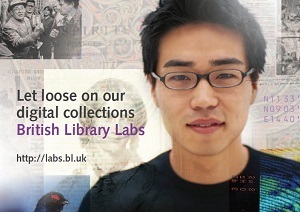 British Library Labs Competition Live – Calling all researchers and developers! Propose an innovative and transformative project that answers a research question using the British Library’s digital collections / data and if your idea is chosen, the Labs team will work with you to make it happen and you could win a prize of up to £3,000. From the digitisation of thousands of books, newspapers and manuscripts, the collecting of UK websites, bird sounds or location data for our maps, over the last two decades we’ve been faithfully amassing a vast and wide-ranging digital collection for the nation. What remains elusive however is understanding what researchers need in place in order to unlock the potential for new discoveries within these fascinating and diverse digital collections. The Labs competition is designed to attract scholars, explorers and trailblazers to the Library who see the potential for new and innovative research lurking within these immense digital collections. Through soliciting innovative and transformative projects utilising this content you will be giving us a steer as to the types of platforms, arrangements, services and tools needed to surface it. We’ll even throw the Library’s resources behind you to make your idea a reality.